Violet was the original mean girl of the Peanuts gang. She was even the first character to call Charlie Brown a blockhead. Her main weapon was social exclusion: “I’m having a party, and YOU’RE not invited!” She was, on the surface, an unrepentant bully and one of the least likable characters in Charles Schulz’s strip. Her meanness was not without reason. Eventually, however, it consumed her, to the point where she had nothing else to offer to her peers. Many of the strips from the series’ first two or three years never were collected before—in large part because they showed a young Schulz working out the kinks in his new strip and include some characterizations and designs that are quite different from the cast we’re all familiar with. At the the time of Violet’s introduction, the only Peanuts characters were Charlie Brown, Shermy, Patty, and Snoopy (who still walked on all fours). 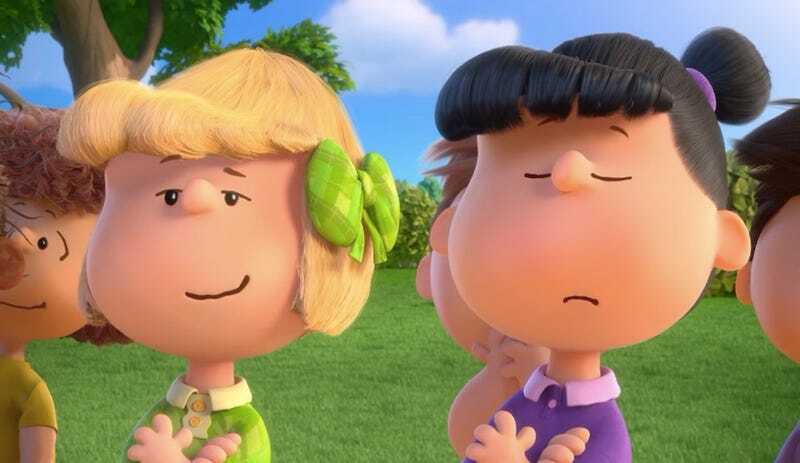 Violet was introduced as a love interest; Charlie Brown and Shermy competed for her affections. Even Snoopy was smitten by Violet. Violet was patient and kind when she debuted, and she supported and encouraged Charlie Brown’s attempts to woo her. She baked him “mud pies” as a means of demonstrating her corresponding affection. But there were already hints of the meaner person Violet would become. Though she was kind to Charlie Brown on the surface, she seemed to delight in gossiping about him behind his back with Patty. Violet and Patty fought over Charlie Brown’s affections. This early love triangle, which dates back to 1952, surprises a lot of casual fans. They’re used to seeing Charlie Brown as a proverbial doormat for the strip’s other characters. But Schulz originally depicted Charlie Brown as a well-liked, all-American boy, even a bit too cocky for his own good. Early Charlie Brown’s predominant flaw was not his insecurity and need for approval, but the opposite: his overconfidence and obliviousness to other people’s feelings. He had a preoccupying need to be right in every argument, and he would puff up his own importance at others’ expense. Most times, Violet was on the receiving end of this treatment. Other times, he ignored or overlooked Violet’s accomplishments in favor of his own. Once, in a Sunday strip from 1953, Charlie Brown even physically bullied Violet. Eventually, Charlie Brown’s capacity to be a jerk caused Violet to respond in kind. He seemed to expect that his actions wouldn’t have any consequences—that the girls would like him regardless—but his behavior took its toll. In July 1953, the friendship, or courtship, between Charlie Brown and Violet came to an end. Charlie Brown was, once again, rubbing in that he was right and she was wrong. Violet, for the first time, took the sort of ad hominem cheap shot that would become her defining characteristic: “You have a homely face!” It was mean, and it was effective; Charlie Brown had no clever comeback to something like that. Unlike walking away or throwing ice cream, Violet used an insult that was more personal and cutting. After that, Violet’s putdowns became increasingly cruel. A month later, Patty joined in on the fun. After teaming up to insult Charlie Brown, they talk about him in the third person, as though he isn’t there. Violet seemed to be rubbing in how much joy bullying Charlie Brown brought her. By the mid-to-late 50’s, Charlie Brown was no longer an arrogant blowhard. His character had evolved into something completely different; he now felt so ordinary that he thought he was invisible. But Violet’s cruel treatment continued unabated, with no pretense of the friendship they once had. By then, Violet had also added her infamous “NYAH”s to her repertoire of insults—a reliable way to hurt Charlie Brown every single time. Psychological pain became physical pain, and Charlie Brown would stagger away from these interactions clutching his stomach. At first, Violet picked on Charlie Brown as a proportional reaction to his treatment of her. But once he stopped fighting back, her attacks were of her own volition. What’s more, she took pleasure in causing him pain. She would walk away from their interactions with her head held high, often with a blissful half-smile on her face. Having drawn blood, she had decided she liked the taste of it. Around the same time, Violet developed a snobbish side. She took to boasting about her family’s accomplishments and possessions, particularly her dad’s. Violet always targeted things that were out of Charlie Brown’s control—his economic class, his looks, the absence of an invitation—which made the insults hurt him even worse. While the rest of the Peanuts gang grew more emotionally complex by the week, Schulz never developed Violet beyond this one-note cruelty. New characters like Peppermint Patty and Marcie had multiple layers of characterization, but Violet kept harping on the same topics with increasing pettiness. Eventually, the gang turned on Violet, probably because they were sick of her toxicity. When they went after her, they went hard, by attacking her on a personal level. Violet bragged about her parents so much that it would make sense to assume there was an underlying cause. Of course, in the world of Peanuts, parents were seldom present—readers never learned much about these successful, overachieving people whom Violet wielded as a weapon against her peers. But the rest of the gang must have suspected something, because they turned what seemed like Violet’s insecurity about her parents against her, starting with this strip in 1958. The characters stopped being afraid of Violet. They learned that she was just as emotionally vulnerable as they were. When Lucy showed up, she gave Violet a run for her money as the town bully. Lucy was wittier, sharper, and meaner than Violet. She also had a softer, vulnerable side that Violet had long since abandoned. In the above strip from 1959, Lucy beat Violet at her own game. This was a figurative passing of the torch, from one mean girl to a meaner one. Violet would continue on in the strip; her last appearance was in 1997, two years before Schulz retired. But now, she was relegated to background roles. Violet would be a face in line at the movie theater or one of many members of a crowd scene. This rare appearance with Pig-Pen from 1981 functions as a sort of meta-commentary. Fans hadn’t seen much of either character by that point, and there was something sweet about reuniting and catching up with both of them. Violet was still snobby (though more low-key about it). Pig-Pen was still dirty. Some things never change. Bullies do not exist in a bubble; their actions are nurtured. Violet became a bully after Charlie Brown’s mistreatment of her, and even as his character changed, she was never able to let go of how he’d behaved in those early days. Thanks to Fantagraphics and the Schulz family, we have a clearer perspective of Violet’s original motivations, and we can disregard the revisionist narrative that Violet was always unlikeable. Schulz’s earlier, and later disregarded, belief was that his strip ought to present a consistent characterization—that his later characterizations were the ‘official’ ones. On the contrary, the characters gain depth by the way we see them grow and change, especially in those infancy years. Violet is a perfect example of that.